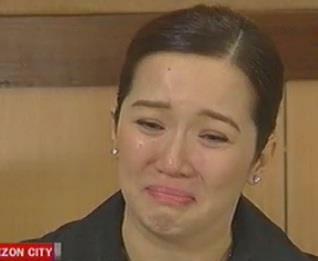 Due to the controversies that the Queen of All Media Miss Kris Aquino and her former husband James Yap these past days, the TV-host actress has resigned from her showbiz career this afternoon (Thursday March 21, 2013). On her live interview in TV Patrol, Kris Aquino herself announced that she is already resigning on all her shows for the sake of her youngest son Bimby. "I'm giving up my shows. Tinatalikuran ko yung mundo na bumuhay sakin dahil higit sa karera ko mas mahal ko ang anak ko. I'm tendering my resignation. Sa puso ng isang nanay, ito ang dinidikta sakin," said Kris. It could be remembered that James Yap was obliged by the Court to avoid going near to Kris and his son Bimby through the 30 day temporary protection order. The basketball player (Yap) was accused by the Kris of committing sexual assault against her in front of their son Bimby.